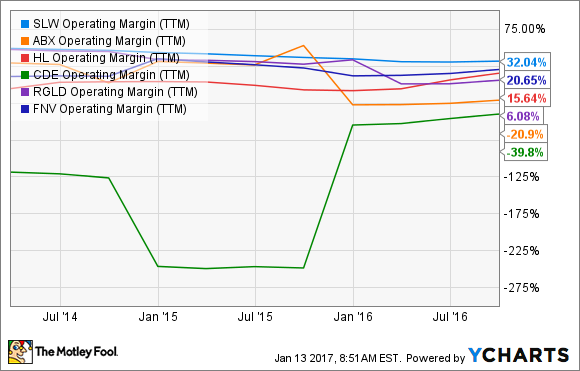 These five precious metal stocks are your best bets now. I've chosen these stocks based on their inherent competitive advantages and growth potential, which I believe are strong enough to drive them even higher after a solid rally last year. Read along to decide which stock best suits your appetite. 2016 can be called a turnaround year for Barrick. During its last quarter, the gold miner turned a profit of $175 million compared with a loss of $264 million in Q3 2015, upgraded its full-year gold production guidance, lowered its full-year all-in-sustaining-costs (AISC) guidance to $740-$775 per ounce, and confirmed its debt reduction target of $2 billion for 2016. Now, that kind of report packs a punch and should make any investor bullish about the miner. What's more, Barrick aims to remain free-cash-flow positive at gold prices as low as $1,000 per ounce. It generated solid FCF worth $1.5 billion in the trailing 12 months despite losses as it optimized capital spending. If Barrick's FCF continues to trend higher, which I believe it will, investors can even expect a dividend raise going forward. As Barrick strives to cut down its AISC to $700 per ounce by 2019 to remain the lowest-cost producer in the industry, shareholders should be rewarded along the way. Hecla's incredible rally in 2016 wasn't a fluke: The silver miner had a lot going for it. Hecla's revenue hit a record high in Q3 and jumped 47% during the nine months ended Sept. 30, 2016, as recent project expansions paid off. Hecla just released its preliminary full-year numbers: Its gold and silver production jumped 48% and 24%, respectively, to hit record highs in 2016. Hecla isn't resting on its laurels, though. It plans to ramp up production further this year and also has acquisitions on its radar, which should push its cash margins even higher. Higher production and lower costs are also boosting Hecla's cash flows, so much so that its FCF came in at around $38 million for the trailing 12 months compared to negative $31 million in 2015. That's a dramatic turnaround and sets the pace for another strong year for Hecla. Coeur's story is similar to Hecla's: rising production, declining costs, and expanding cash flow. Coeur's silver equivalent production hit record highs of 36.3 million ounces in 2016. Here are two numbers you should know: Coeur's production has grown 50% since 2014, and the company is targeting 9% higher production at the midpoint of 2017 as it ramps up its primary mine at Palmarejo, Mexico. Palmarejo could, in fact, be a game-changer, as Franco Nevada recently struck an agreement with Coeur to purchase 50% of the mine's production at $800 per ounce, almost twice the amount it paid under the old agreement. That should mean rapid growth for Coeur's free cash flow, which hit multiyear highs of $42 million during the trailing 12 months. Meanwhile, Coeur also lowered its debt by 21% in Q3 -- a trend I expect will continue in coming quarters. As production and cash flow rise, so should Coeur's stock. As a streaming company that doesn't own mines but buys bullion from other miners at prices substantially below spot rates -- its average purchase cost is only about $4 per ounce of silver and $400 per ounce of gold -- Silver Wheaton's margins are the best in the industry. The biggest catalyst for Silver Wheaton is gold, which should make up 45% of its production by 2020. Higher gold production sent Silver Wheaton's operating cash flow jumping 62% year over year in Q3, encouraging the company to increase its dividend by 20%. So you can imagine the growth potential Silver Wheaton can unlock for its investors in 2017 and beyond as it increases its exposure to gold. At 15 times price-to-operating cash flow per share, the stock is also cheaper than that of streaming peers Franco Nevada and Royal Gold, making it a top pick today. The primary reason this African gold miner has made it on my list is its impending acquisition of Stillwater Mining -- the largest and lowest-cost primary producer of platinum and palladium in the U.S. -- in an all-cash deal worth $2.2 billion. As these metals have diverse uses across key industries including automotive, electronics, and petroleum refining, a boost in infrastructure spending in the U.S. and a recovery in the oil and gas markets could be a big boon for Sibanye. In fact, the palladium industry is already facing a supply crunch -- a factor that has sent palladium prices soaring in recent months. Sibanye expects the acquisition to be immediately accretive and is confident of maintaining stable dividends going forward. Sibanye paid out a hefty interim dividend last year and currently yields an eye-popping 6%. 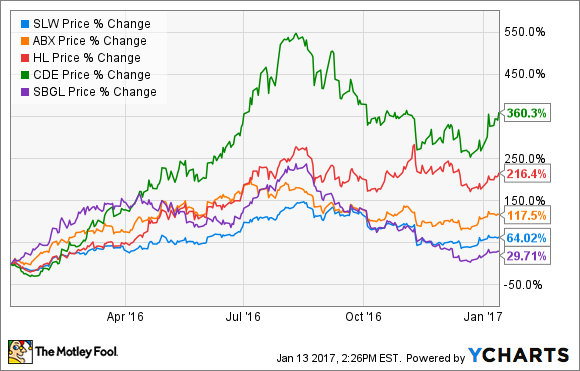 That dividend, and the tremendous growth potential in the palladium markets, makes Sibanye a top pick for 2017.